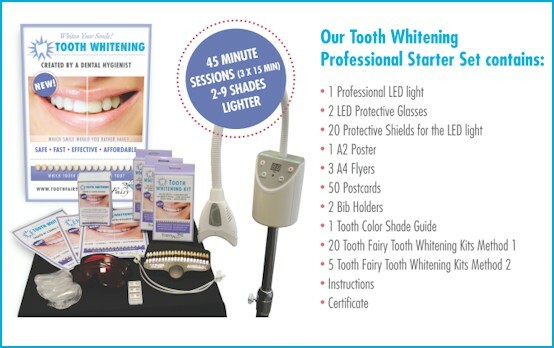 Tooth Whitening Starter Set - Tooth Fairy GmbH - "Style Your Smile"
Tooth Fairy products are produced by a dental professional who has been internationally retailing Tooth Crystals within the professional beauty and hair market since 1999. Tooth Fairy is already famous for top quality products, training and customer support. Tooth Whitening with a LED light was inspired within the beauty, hair and nail market due to a change in cosmetic laws. The law has changed into “one does not have to be a dentist to perform this treatment since it is now a cosmetic product”. Many people have always dreamed about having their teeth whitened but found it was too expensive to have the treatment within a dental office. The treatment price for the client has been reduced within the salons making it more affordable for people to whiten their teeth. You will charge the client between £70-150, €70-150, CHF 120-250 for one complete treatment. Here you can download our original flyer. Tooth Fairy believes Tooth Whitening is the trendiest and largest profit making treatment in today’s beauty, hair and nail market. We have opened our own Tooth Whitening Centre to provide the service to the public. Tooth Fairy attends 40 beauty and hair exhibitions throughout Europe each year where we will be launching our new Tooth Whitening System into every country.